Crystell is a 14 year old whose parents died in the Haiti earthquake. While rescuing her nephew, a wall collapsed on her leg, and her leg was amputated shortly afterwards. I have previously written about her here and here. 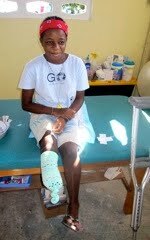 Crystell had to move to the orphanage because her siblings did not want to take care of an amputee. As you can imagine, this made Crystell very sad and very self-conscious. However, with a lot of encouragement and perseverance Crystell is headed in the right direction. Quite literally she is heading towards a brighter future, as she was fortunate to receive a prosthetic limb about a month ago. How exciting! Three of the other children who had lower limb amputations also received prosthetic limbs, including Mistil I’ve been told! How I would love to see a picture of him with his new leg! For his story click here.